The Hobbit-like human was smart enough to make stone tools despite its small brain, according to research which was released in 2006. Sharpened flints found on the remote Indonesian island where it lived suggest that this human cousin inherited tool-making skills from its ancestors. Some have claimed that its brain was too tiny to perform the complex tasks which are seen as being a hallmark of human culture. 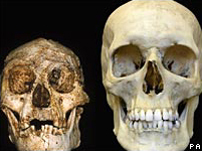 The 2006 study in Nature backed the view that the Hobbit was a new species rather than a modern human with a brain disease. 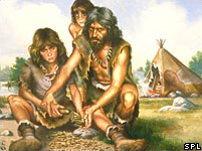 It had been said that the brain size was far too small for these Hobbits to be capable of any sort of sophisticated culture, but the new study suggested that this may not have been the case, a view which was confirmed by chief researcher Adam Brumm, of the Australian National University in Canberra, Australia. He stated that the brain size was very small but it would have been capable of what we call culture. It's an aspect of humanity that isn't readily seen in the likes of chimps and other great apes. The discovery on the Indonesian island of Flores of the remains of an ancient diminutive people caused a stir in the scientific world in 2004. The team which made the initial find said that it represented a new branch of humanity's family tree. The researchers believed that the one metre-tall people (three feet) which have been named Homo floresiensis evolved from an unknown small-bodied, small-brained ancestor, which they think became small in stature to cope with the limited supply of food on the island. The tiny humans are thought to have survived until about 12,000 years ago, when a volcanic eruption devastated the region. The discovery was hailed as one of the most significant fossil finds for more than a century. However, a small minority of vocal scientists still disagreed. They believed that, rather than being a completely new species, the Hobbit was merely a modern human that had microcephaly, a congenital disorder that stunts brain growth. All scientists had to go on were skeletal remains found amongst a scattering of flint tools in Flores' Liang Bua cave. Some argued that the tools were too advanced to have been made by a creature with such a small brain and must have been made later in history by a more advanced human species. However, the joint Australian-Indonesian team of researchers compared the tools found in the Liang Bua cave with other, much older, artefacts discovered on the island at several different archaeological sites. They were able to say that these tools from different time periods all bore striking similarities, suggesting that they were made in the same way by a long lineage of ancient humans. It was basically the same technology. That suggested a continuing tradition of tool-making on the island over many hundreds of thousands of years. The report's authors believed that the Hobbit inherited tool-making skills from ancestors who lived on the island from about 800,000 years ago. The tools themselves were quite simple, according to Dr Brumm. The hominids were basically striking pieces of stone off volcanic cobbles. It was a very simple manufacturing process. The implements may have been used to process plants for food, slash animal skins, or carve wooden tools, although no one was entirely certain. The 2006 data was unlikely to convince all scientists, however, not least because there existed a very long time gap between those tools which were forged some 800,000 years ago, and those found at Liang Bua. Thanks to the large time gap it couldn't be guaranteed that this material really was related. However, it did reinforce the argument that the Hobbit really is a descendant of a population that had lived on the island for a very long time. This potentially allowed enough time for the unusual features of the Hobbit to develop.